Ependymoma is a rare tumour of the central nervous system (CNS). This text provides information about the characteristics of this disease, its frequency, causes, symptoms, diagnosis, treatment, and prognosis. Ependymomas are tumours of the central nervous system (CNS). They are solid tumours arising from malignantly transformed cells of the brain or spinal cord. Since they develop directly from CNS cells, they are also called primary CNS tumours in order to distinguish them from cancers of other body parts that have spread to the CNS (metastasis). There are different types of ependymomas – some of which grow rather slowly, while others expand fast. Nevertheless, since for a growing mass the room in the bony skull is limited, even slow-growing ependymomas can become life threatening. Ependymomas arise from malignantly transformed cells of the ependyma. Ependyma cells are the cells that form the inner coat of the brain’s cavities (ventricles) as well as of the spinal canal. Therefore, most ependymomas are situated in the ventricles or the spinal canal. The majority of epenymomas (about 60 %) is found in the fourth ventricle, which is located in the lower back of the skull (posterior fossa). From there, they tend to grow toward the cerebellum, the brain stem and the cervical spine. The doctors call this infratentorial growth. About 30 % of ependymomas grow in the area of the so-called lateral ventricles in the cerebrum (supratentorial growth); 10 % are located in the spinal canal (intraspinal). In less than 5 % of children with either supra- or infratentorial ependymoma, the tumour has already spread within the central nervous system (CNS) at the time of first diagnosis. Tumour spread (metastasis) outside the CNS, for example into the lung and/or lymph nodes, is rare. Ependymomas are overall rare. They comprise about 10 % of all primary central nervous system tumours in childhood and adolescence. Although mostly affecting children in the first three to four years of life, ependymomas can generally occur in any age group. The average age at diagnosis is six years. 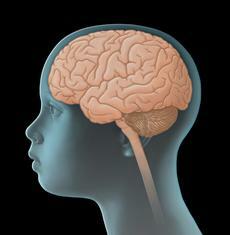 In Germany, about 45 children and adolescents under the age of 15 years are newly diagnosed with ependymoma each year. This corresponds to an incidence of about four new patients in a group of 1.000.000 children. Boys are a slightly more affected than girls (gender ratio: 1.4 : 1). The features of ependymoma that are found by looking at the tumour cells under the microscope (histological characteristics) are diverse. The doctors differentiate so-called low-grade ependymomas, the cells of which do not proliferate fast and which thus grow slowly, from high-grade ependymomas with high proliferation rates and aggressive growth behaviour. Anaplastic ependymoma WHO grade III: tumour with aggressive behaviour. The cut-off between grade II- and grade III-tumours cannot always be clearly determined. Therefore, this classification not used to predict the growth behaviour of an individual tumour. The causes for the development of ependymoma are still unknown. In general, individuals who received radiotherapy of the brain when they were young, for example children with acute leukaemia or retinoblastoma, have an increased risk of developing a brain tumour later. Also, patients with Neurofibromatosis Type II (NF II) have a higher risk of ependymoma in the spinal canal than their healthy peers. Unspecific general symptoms occur independently of the tumour’s location. They may be similar to and therefore mimic other, non-CNS diseases. General symptoms of a child or adolescent with a CNS tumour may include headaches and/or back pain, dizziness, loss of appetite, nausea and vomiting (particularly after getting up in the morning), weight loss, increasing fatigue, inability to concentrate, school problems, mood swings, and character changes as well as developmental delay, to name a few. Major reason for these symptoms is the slowly but continuously increasing intracranial pressure (ICP). Elevated ICP may be caused by the growing, thus more and more space-occupying tumour within the bony skull, but also by the tumour blocking the regular flow of the cerebrospinal fluid, thereby forming hydrocephalus. In babies or small children with soft spots (open fontanelles), elevated intracranial pressure and hydrocephalus typically present with a bulging fontanelle or a larger than expected head circumference (macrocephalus), respectively. Local symptoms may indicate the tumour location, thus, which functional regions of the CNS might be affected. Thus, an ependymoma in the cerebellum can cause dizziness and gait disturbances, whereas such a tumour in the hemispheres can be associated with seizures and/or motor deficits and a tumour of the spinal cord with different kinds of neurological impairments such as motor and sensory deficits as well as typical gait disturbances. Also, impaired vision, mental and sleep problems may, although to a lesser extent, be indicative of tumour location. 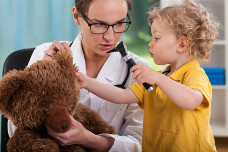 If the paediatrician thinks that the young patient’s history, physical exam and possibly even results from diagnostic imaging are suspicious of a tumour of the central nervous system (CNS), the child should immediately be referred to a hospital with a childhood cancer program (paediatric oncology unit), where further diagnostics can be initiated and performed by childhood cancer professionals. Very close collaboration between various specialists (such as paediatric oncologists, paediatric neurosurgeons, paediatric radiologists, to name a few) is required, both to find out, whether the patient really suffers from a malignant CNS tumour and, if so, to determine the tumour type and the extension of the disease. Knowing these details is absolutely essential for optimal treatment planning and prognosis. The initial diagnostic procedures for a young patient presenting with a suspected CNS tumour at a childhood cancer centre include another assessment of the patient’s history, a thorough physical/neurological exam and imaging diagnostic, such as magnetic resonance imaging (MRI) and, sometimes, computed tomagraphy. These diagnostic tools help to confirm or rule out the diagnosis of a CNS tumour as well as to determine possible spread of the disease in other parts of the CNS, including those in the spinal canal. Also, tumour size and site, its extent with regard to the adjacent tissue, and hydrocephalus can be assessed by these imaging techniques. For final diagnosis of a CNS tumour, the microscopic (histological) analysis of tumour tissue (for example obtained during surgical tumour removal or by biopsy) is required. The extent of histological analysis has increased exponentially in the last years. Histological information helps validating final diagnosis. Some features may even be predictive of the course of the disease, for example of the tumour’s growth behaviour, thereby playing important roles in treatment planning. Depending on the patient’s individual disease and treatment situation, additional tests may be required for establishing the diagnosis. After the diagnosis has been confirmed, therapy is planned. In order to design a highly individual, risk-adapted treatment regimen for the patient, certain individual factors influencing the patient’s prognosis (called risk factors or prognostic factors) are being considered during treatment planning (risk-adapted treatment strategy). Important prognostic factors are the type, the localisation, size, and spread of the tumour. The extent of surgical tumour removal has a major impact on prognosis. So do the patient’s age and overall physical condition. All these factors are included in treatment planning in order to achieve the best possible outcome for each patient. Treatment of children and adolescents with ependymoma should take place in a children's hospital with a paediatric oncology program. Only such a childhood cancer centre provides highly experienced and qualified staff (doctors, nurses and many more), since they are specialised and focussed on the diagnostics and treatment of children and teenagers with cancer according to the most advanced treatment concepts. The doctors in these centres collaborate closely with each other. Together, they treat their patients according to treatment plans (protocols) that are continuously optimised. The goal of the treatment is to achieve high cure rates while avoiding side effects as much as possible. Current treatment concepts for children and teenagers with ependymoma include surgical tumour removal, radiotherapy and, for some patients, chemotherapy. Very young children receive chemo- prior to radiotherapy to delay the beginning of radiation. Surgical tumour removal plays an important role in the treatment of ependymoma, because the extent of tumour resection has a major impact on the subsequent course of the disease: complete tumour resection is usually associated with a more favourable prognosis than partial resection, which may be the only option in some patients with advanced disease, for example. If complete resection was not achieved during primary surgery, the doctors will recommend a second attempt of resection as long as the risk of the procedure is justifiable. However, some ependymomas are located in parts of the brain that make complete resection impossible. In particular, tumours in the area of the fourth brain cavity (ventricle) and in the so-called cerebello-pontine angle usually allow only partial removal. Complete resection would be associated with a high risk of damaging healthy, vitally important brain tissue. Patients with ependymoma WHO grade I, whose tumour could be completely removed, usually do not need additional treatments. They are regularly seen by their caregiver team for physical exams and imaging controls. For patients with ependymomas presenting with signs of malignancy such as ependymoma WHO grade II or III, respectively, additional treatments are indicated, even if complete tumour resection was achieved. The reason beyond this strategy is that, despite macroscopic (that means visible) total removal, remaining tumour cells, which are invisible to any surgeon’s eye, may be left at the tumour site. These remainders are associated with a high risk of recurrent disease at the original tumour site (local relapse). Recurrent disease at other sites is rather rare. Radiotherapy and, for some patients, additional chemotherapy help reducing the risk of local relapse. Good to know: The doctors will recommend the type of additional treatment based on the type of ependymoma, its spread, the extent of surgical removal and the patient’s age at diagnosis. In Germany, almost all children and adolescents with first diagnosis or relapse of ependymoma are treated within therapy optimising trials or registries. The term therapy optimising trial refers to a form of controlled clinical trial, which aims at improving current treatment concepts for patients based on the current scientific knowledge. Patients who cannot participate in any study, for example because none is available or open for them at that time, or who do not meet the required inclusion criteria, respectively, may be included in a so-called registry. Such a registry pools scarce data in order to help with the planning of appropriate future clinical trials. To ensure optimal treatment for patients not registered in a study, experts from assigned trial panels usually provide recommendations and advice to the local caregiver team. In Germany, a long-term therapy optimising trial (trial “HIT 2000”) for the treatment of children and adolescents with ependymoma was closed in 2011. Many children’s cancer centres in Germany and Austria had participated in this trial. There is currently no open trial for patients with childhood ependymoma. A subsequent European study (“SIOP-Ependymoma II”) was opened in France and will most certainly recruit German patients as well soon. I-HIT-MED Registry: Patients with ependymoma, who for different reasons cannot or do not want to participate in any currently available or open trial, can be enrolled in this registry, regardless of the treatment given. These patients will receive treatment as per individually designed treatment plans. The goal of the registry is not to assess the feasibility of an ongoing trial, safety or efficacy of a certain treatment. It rather aims at collecting individual patient data for future analysis. The headquarters of the registry are located in the Children’s Cancer Centre at the University of Hamburg, Germany. The head of the study is Prof. S. Rutkowski. HIT-REZ Registry: Patients, whose disease does not respond to current treatments (therapy-resistant, progressive ependymoma) or with recurrent disease (relapse), respectively, can be enrolled in this registry, which has been open since January 2015. This registry does not serve to test new treatment regimens or drugs. However, the experts running the registry are providing treatment recommendations based on the most recent results obtained from national (for example from the HIT-REZ 2005 trial, which was closed in 2016) as well as international relapse trials. The headquarters of the registry are located in the Children’s Cancer Centre at the University of Essen, Essen, Germany. The head of the study is Prof. G. Fleischhack. The prognosis of children and teenagers with ependymoma mainly depends on the extent of surgical tumour removal. Survival rates for patients after complete resection and subsequent radiotherapy are between 60 and 75 % after five years and between 50 and 60 % after 10 years, as long as the disease does not progress. After partial tumour removal, survival rates of 30 to 40 % can be achieved. When patients suffer from a recurrent ependymoma, opportunities for another surgery and/or radiation therapy will be evaluated. There is evidence that special irradiation techniques can increase the average time of survival. Recurrent ependymomas are also sensitive to chemotherapy so that this form of treatment can improve the outcome for relapse patients. Note: The survival rates mentioned in the text above are statistical values. Therefore, they only provide information on the total cohort of patients with these types of tumours. They do not predict individual outcomes. In the context of cancer, the term „cure“ should rather be referred to as „free of cancer“, because current treatment regimens may help getting rid of the tumour, but they are also frequently associated with numerous late-effects. Early detection and appropriate management of these long-term sequelae typically requires intensive rehabilitation and thorough long-term follow-up care, although a patient may have been cured of the cancer. The central nervous systems consists of the brain and the spinal cord.